The Xcel Program is a national USA Gymnastics program of gymnastics levels that runs alongside the Junior Olympic (JO) program. The Xcel program is a completely separate, alternate program. Through the years we have spoken to a lot of parents who want help deciding whether their gymnast should compete in the Xcel program or switch to a gym that would have them compete in the traditional JO program. There are advantages and disadvantages to both programs, and some gyms choose to compete in it, while others don’t. 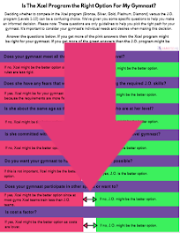 Click Here to Download GymnasticHQ’s Worksheet- Is the Xcel Program Right for Me? Some gyms see the Xcel program as an avenue for their less serious gymnasts to compete. Other gyms supplement their JO program with the Xcel program. While even other gyms focus on the Xcel program to produce well-rounded gymnasts, and then mobilize them through the compulsory levels. Many parents questions why their current gym would want their daughters to compete in the Xcel program. After talking to them, we’ve realized that it can be confusing why USA Gymnastics created the Xcel program. There are some definite advantages to it, along with some considerations, which we’ll detail below. The Xcel Program was created as a national program in 2013; some states had a similar program known as the Prep Optional program. However, the national Xcel program has more levels and spans a much greater level of ability than most states’ Prep Optional program. You can start competing at a lower skill level in the Xcel program, than you could previously. There are five divisions in the Xcel program: Bronze, Silver, Gold, Platinum and Diamond. All of the Xcel divisions have optional rules. You can read more about the difference between optional and compulsory here, but basically optional rules mean that there are only 4-5 routine requirements and each gymnast can have her routine choreographed for her personality and individual strengths and weaknesses. Whereas, in compulsory levels, the routine is already choreographed and every gymnast must perform the routine exactly the same. Because of that, the judging can be more strict and produce lower scores than what the gymnast may have in Xcel. With higher scores your gymnast may feel better and be more motivated to stick with the sport . 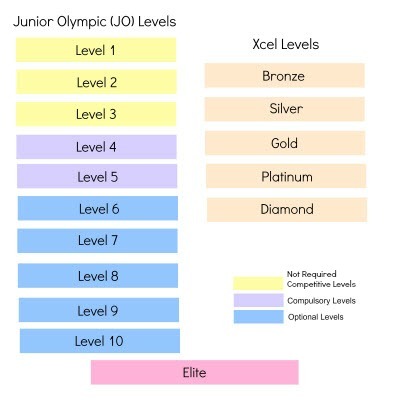 In the Junior Olympic program, the first Optional level is level 6, which is comparable in skill level to the hardest division in the Xcel program, the Diamond division. So without the Xcel program, a gymnast could be involved in the sport for years without ever getting to compete an individual, customized routine. 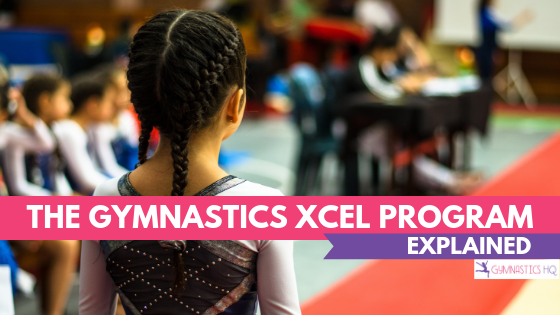 The Xcel program was created as a way to keep gymnasts involved and excited about the sport. If you think about most other sports, like for example soccer, as soon as kids join the sport they almost immediately start competing in games and tournaments. With gymnastics it wasn’t this way. Kids would join gymnastics and have to take classes for several years before they were invited to join a team program. The Xcel program allows gymnasts to start competing almost right away, by lowering the skill requirements for the entry levels. However, the Xcel program doesn’t just have basic entry levels. It also has more advanced levels that allow gymnasts to keep competing in the Xcel program as they learn more skills, but without the same pressure as competing in the JO program. The Xcel program is ideal for not only entry-level gymnasts, but also older gymnasts who are looking for a fun way to stay in shape and be involved in the sport. And since high school gymnastics programs sometimes use similar rules as Xcel, it can be a way to prepare gymnasts to try out for a high school gymnastics team. The Xcel program is also for gymnasts who compete in the compulsory Jr. Olympic levels and would like to compete in an optional program during their “off” season. Compulsory meets are often in the fall, and there are usually some Xcel meets that are in the optional spring season. Gymnasts get to have fun competing sooner. Gymnasts get to have fun competing with the Xcel program as soon as they join an Xcel team. They don’t have to wait to be invited to a JO team. Gymnasts compete individual, personalized routines. Most athletes would rather compete routines that are customized to their age, strengths, taste and personality. Is it more fun to do a floor routine to stuffy, instrumental music like in the compulsory program, or cute, fun music the gymnast has picked out? For example, an older gymnast could use a current hit song (without lyrics of course) as her floor music. The Xcel Program can be less of a time commitment. The compulsory program can be unforgiving, with its routines that require gymnasts to learn an exact set of skills regardless of their strengths. Gymnasts can spend less time in the gym but still be able to learn skills that allow them to compete. Gymnasts are not required to compete all four events. With the Xcel program, gymnasts are not required to compete all of the events. Gymnasts can specialize in one or two events and choose to not compete the others. There is no direct mobility from Xcel levels into the Jr Olympic Levels. Even if a gymnast has competed all the way through Diamond in the Xcel divisions, which would be similar to a level 7, in order to compete at level 7 she must pass out of levels 4 (the lowest required competitive level) , 5 and 6. She can just compete in one meet at each level to mobilize, as long as she earns a minimum mobility score. The Xcel Program doesn’t emphasize progressions the same way that the compulsory routines in the Jr Olympic program do. The JO compulsory program was created the way it was partly because it’s a system that has been proven to create great gymnasts. If your goal is to obtain a college scholarship, then the compulsory program is probably the best way to learn the proper progressions and discipline you need. We’ve linked to the Xcel Gymnastics Skill Requirements for each Xcel level below. You can also check out GymnasticsHQ’s Skill Progression Checklists for Xcel Bronze & Silver, and Xcel Gold, Platinum and Diamond. Each gym and coach uses the Xcel program in their own way, and the program offers the flexibility to do so. 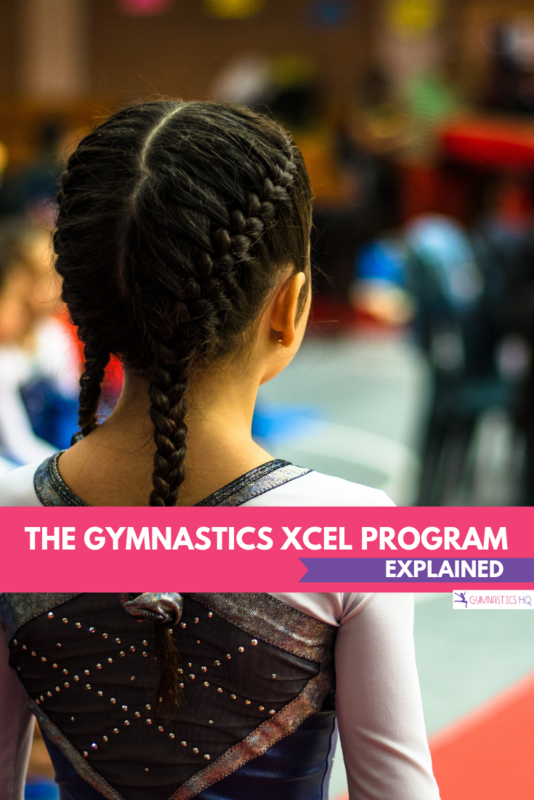 Hopefully this information about the Xcel program can help you decide whether it is the right program for your gymnast. could you recommend any gymnastics summer camps like overnight or all day? One really good camp is Flip Fest in Tennessee. I’m going this summer and it’s so much fun!! Your gym may also have special team camps or overall gymnastics camps at your gym. Hope this helps! My daughter goes to the International Gymnastics Camp in the Pocono Mountains of Pennsylvania. She had just finished competing Level 5, yet even scoring out her strength as Level 5 wasn’t enough. We were deciding whether to go to Level 6 or spend another year mastering the skills. We sent her to IGC for 1 week. She got to meet several olympians inclusing her favoeite – Courtney Kupet. With the training she received and her dedication in attending every open gym; she came back mastering her Level 5 and Level 6. So, when we returned she practiced with Level 7 and competed that year as a 7. All of this when 1 year. She placed 11th in State in her class and age. It is a little more expensive than the other camps out there but the coaches, olympians and dedication, it is well worth it. You won’t be disappointed. Level 8 – here we come. C3 gymnastics has really fun summer camps. They do excel too. do you know any good gymnastics camps in Louisiana? The University of Louisiana (LSU) has a summer camp. Was one of our considerations this year. We normally do just International ($1,195) (7 days overnight) in Philadelphia. Her favorites were LSU, Bama and Auburn; and of course Florida. We can only do 2. This year in International and University of Alabama ($650)(4 days). I was Xcel, but I also trained with some J.O. ‘s, just because your gym i rude doesn’t mean every ones is. So dont tell people not to join Xcel just based on your experience. How old do you have to be to start Xcel? Does this t depend on your gym? I am so confused right now, my daughter just turned 5 and she was invited to JO level 2. I have read so many options and have talked to other parents. Some of my frienfs moved to different gyms and her friends’ moms chose Xcell and stayed in the same gym. I know my daughter loves gymnastics but the commitment is 7h a week for a future kindergarten makes me scared. I am not a savior on Gymnastics so I don’t want to rush her. She wants to show her routines to other people too. Ideas? Is there any gyms in Pa thats have excel? Can a Xcel Gold gymnast move to J.O level 4? Can a 12 years old Xcel Gold gymnast move to J.O level 4? Hi – I just ordered the bundle of chart progressions -they look like a great resource! Is the info updated to show the new 2018-2022 guidelines? I think new ones are coming out for Xcel according to the USAG website. Thanks. Hi, yes I am anxiously awaiting the new rules to be published so I can update this information. I’m going to send you an email now about your bundle purchase. If you have an athlete that is at a Level 2 JO but has their double back-handspring and standing back tuck … but is lacking in some of the required beam skills, would you recommend they transition to the XCEL program? The athlete has scored within the 9s consistently on every apparatus at Level 2 and her lowest AA score was a 35.3. She has been practicing with the Level 4 group during move-up clinics, but again, her fear is holding her back from reaching the Level 4 required beam skills, and some of her skill surpasses the Level 3. Our gym is introducing the XCEL program for the next comp season and I’m torn on what to do for her. Her ultimate goal is collegiate, but she is 12 … and we don’t know if the XCEL would be a poor choice in pursuing the collegiate bid later. She only started lessons 7 months ago, and we know we have a lot of catch up to do – but I also know the routine “style” of XCEL is more appealing for her. We do private lessons and additional gym time on top of our current required practices already in hopes to gain those missing skills before team decisions are made for comp season over the summer. Help – what would you do, or what would you advise? Thank you! Typically gymnasts who pursue a collegiate path go through the J.O. program. The levels in Xcel don’t go as high as the J.O. program and in order to be college level material your gymnast needs to have achieved higher levels in the J.O. program (Level 10). However, at her age it can be difficult to be motivated to do compulsory routines. If she loves gymnastics and is doing it for pure joy then it might be fun to compete in the Xcel program. However, the fundamental skills she will learn in the J.O. compulsory program will set her up for more difficult skills in the future which she will need to succeed in college. Bottom line, she needs to assess if doing college level gymnastics is truly her ultimate goal and if so, then J.O. would be a better long term strategy, in our opinion. But at the same time, you want her to maintain her passion for gymnastics. So it’s a decision that has to be made keeping your daughter’s drive and motivation in mind. I know a gymnast that went from xcel gold to Jo and is really good! She never scored out at level 4 and 5. This was 2 years ago. Can she get in trouble?